Wi-Fi Digital Video Camera: Wi-Fi function supports data transfer via the "Action Camera" APP. You can browse your photo in this app. Meanwhile, you can upload videos and pictures to tablet PC, smart phone and laptop. You can easily make videos and share with your family and friends on social media. It also comes with a remote controller which is easy and simple to use. You can also access the recorded files when the app is connected to your camcorder. 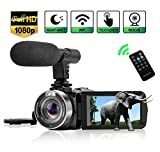 Multifunction Camcorder: HDMI output: you can record video directly when the camera is connected to the TV. Webcam: You can have a video call with your families or friends when connected with your computer. Pause Function: It has pause function so you can start a suspended video without recording a new one. In addition, this camera also supports recording while charging, 3.0" HD Touch Screen, Slow motion video, Motion Detection video, Time-lapse photo, Self-timer, continuous shooting and so on.